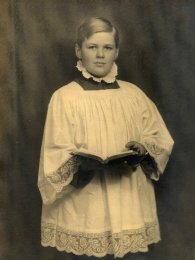 Robert Thurston Dart (1921-71) was born in Kingston, Surrey and attended Hampton Grammar School, where he sang in the choir at Hampton Court. 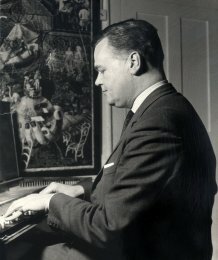 After World War II, when he served in the RAF, he lectured at Cambridge University, later becoming Professor of Music, and then King Edward Professor of Music at King's College, London, where Greg studied under him. 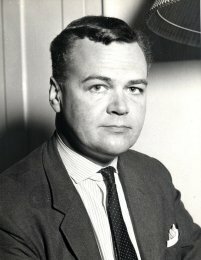 Greg has written a fuller biography of Thurston Dart for this site. Greg organised a reunion for former Dart students at KCL to mark the 30th anniversary of Dart's death. 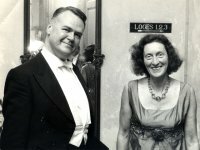 Through his friendship with Bill Oxenbury, Dart's administrator and successor as Secretary of Musica Britannica, he was given assorted items of "Dartiana". These include his juvenile compositions and transcriptions; L.P. records; letters; contracts; committee minutes; photographs; inventories; his birth certificate and will; cartoons; and his school cap! Musicologically speaking, the most interesting item is a manuscript in Dart's hand of "Trois morceaux inédits & inconnus" by Alcetur [c.1550]. It is apparently dedicated to Charles van den Borren on his 90th birthday in 1964. Dart has signed it and described it as "copie unique d'apres l'original". Greg has established a Thurston Dart Archive which is located at Cambridge University Library. The aim is to gather as much Thurston Dart material as possible to add to Greg's initial donation, which forms the foundation of the archive. This will create an accessible Dart archive for the use of future scholars. Leading academics have already contributed letters and papers. In 1974 access to some of Dart’s papers was granted to Susi Jeans. On her death in 1993 these papers were transferred, with Jeans’ own, to the Lady Susi Jeans Centre for Organ Historiography at the University of Reading. When that closed in 2005 they were transferred with the Susi Jeans Collection to The Royal College of Organists Library and Archives at Birmingham City University. The draft chapters have now been donated to the Thurston Dart Archive. There is an invaluable Bibliography of Dart's publications, compiled by Bill Oxenbury and Davitt Moroney, in the volume "Source Materials and The Interpretation of Music", edited by Ian Bent, published by Stainer and Bell, London, 1981, ISBN 0 85249 511 0. Dart's microfilm collection is kept at the Pendlebury Library, Cambridge University Music Faculty, where it has been widely used by researchers and students for many years. Much of Dart’s extensive book collection is located at the library of King’s College, London. Collections can be located through the Cecilia database.